[vc_row][vc_column width=”1/1″][vc_column_text]TV screens with content have been popping up for years. We all remember when box TV’s sat in the windows of stores for years (maybe not the millennials) displaying commercials and TV programming. Now that technology has changed so much we are seeing more of these kinds of screens being instituted in different places. So is that a TV with content or digital signage? 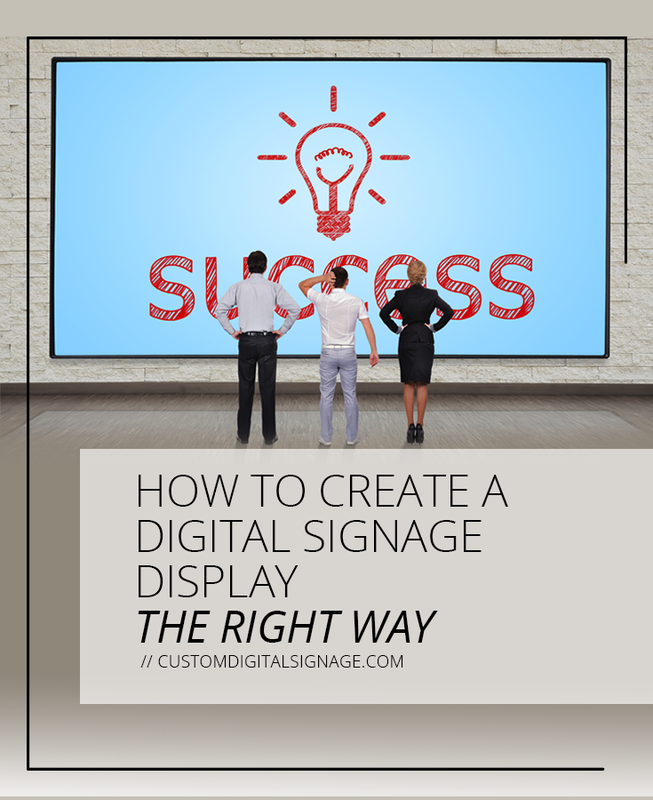 What really makes it digital signage and how can you make a digital display screen the right way? Digital signage displays are exactly what they say they are – signage that is digital of course! But, its not quite as simple putting images on a screen any more. Digital signage hardware and software has taken this simple idea of content on a screen, and turned it into an entire new way to drive sales and grow a community around any brand. Customized media players with smart software have made digital signage a field of its own, despite the simplicity that is shown as the final product. People frequently think they can simply put an image on a TV and that is enough to have an effect on their customer. This is not enough! If you don’t have a clear digital branding strategy for your location, it will be just that. An image with back light. If you want a digital display that actually drives sales you must think past the simple exterior, and get to the heart of your customers and what they want. Where is the first point of contact with the customer? Is it possible to include a display that is not intrusive? Where does my customer spend most of their time waiting? Where do they spend most of their time in whole while with us? How can we best capitalize on our customers wait time while decreasing their unhappiness of waiting? What Must It Be Able To Do? Once you’ve found the a few different positions for your display, think about your strategy. What must it be able to do for my customers to get the most benefit? If you start with the simple features, time, date, weather, general information, news…. then think of the BIGGER picture. Do I need to be able to track customer engagement through my displays? Would my customers benefit from interacting with the content? Do I need the integration of POS or company software to track sales goals? Do I need a motion graphics display to entice customers through video and imagery? Choosing the function requirements will lead you to decide on your 3 key components: Media players, software, and commercial displays. Deciding on what your display will do, will dictate what kind of hardware you need. Start with the software – choose a software that is flexible and scalable to your location. Something that is right for one restaurant may not be right for the salon. Then get a media player. Great players dictate what your sign is capable of. It will decide how smooth your content displays and how effective your message will be. Don’t get caught with a device that’s not up to par! Just as there are many media players on the market there are many fails. All throughout your digital signage project you should have your customers and your strategy in mind. Ensure that what you are choosing is the most cost effective yet best solution for your location and your community. This will in turn help you create content that is specific to your customers needs and provides the exact message you are looking for. There are so many signage hardware, software and displays choices, all these things matter when you are deciding to include digital signage at your place. What would be helpful to know when creating a digital signage display ? How could it be easier?